Integral to Botswana’s agricultural culture, baskets have been traditionally made and used for thousands of years and are still very much in everyday use. Closed baskets with lids are used for storing grain, seeds and sometimes, sorghum beer. Large, open bowl-shaped baskets are used by women for carrying items on their heads and for winnowing grain after it has been pounded. The main producers of the baskets are the women of the Bayei and Hambukushu tribes in north western Botswana. The main raw material used in Botswana baskets is the fibre of the Mokola or ‘vegetable ivory’ palm tree and originally, most baskets were undecorated. Gradually, intricate designs have emerged through the introduction of colour and pattern. Colour is sourced from natural dyes found in the roots and bark of the Motlhakola and Motsentisila trees (browns) and, more recently, from the leaves of the Indigofers shrub (mauve), and the husks of sorghum, the fungus from which provides a lovely pink shade. The patterns are either one-off abstracts or symbolic of the local environment and wildlife. Various basket designs which have been passed from generation to generation are associated with the nation's traditional lifestyle. There is, for example, a zig-zag pattern known as " the bull's urine trail " which describes the patterns caused by the movement of the bull’s sheath whilst it walks and urinates. 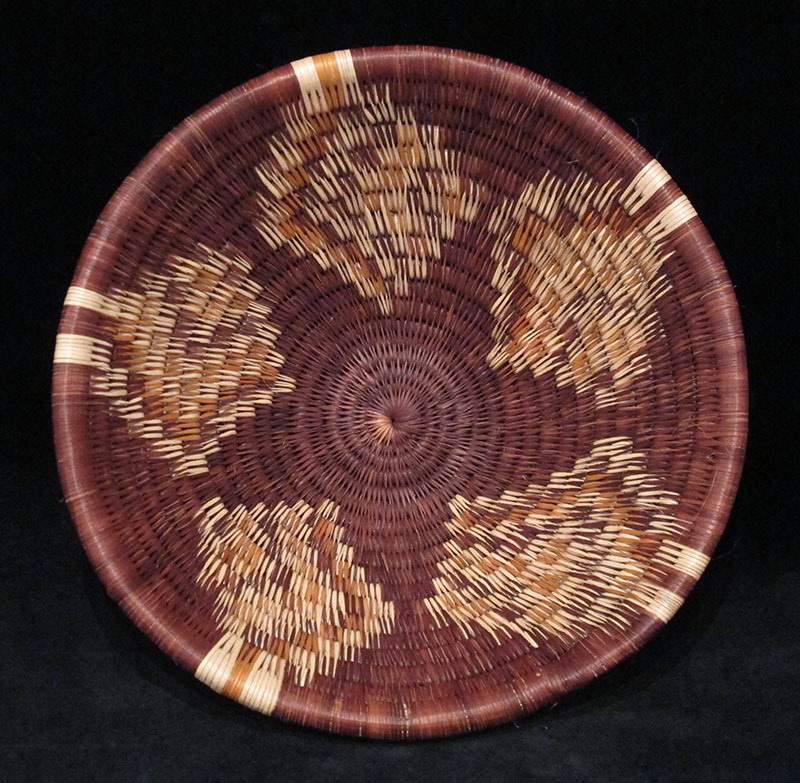 Botswana baskets are woven using the coil method. A thin bundle of palm fibre, grass or a single piece of vine is used for the interior. A small hole is pierced into the previously woven row with an awl and a strip of palm is then inserted into the hole and wrapped around the core. Designs are created by weaving strips of dyed palm at appropriate intervals. Each basket takes up to six weeks to complete. Above information courtesy of embassy of Botswana.